pastured? cage free? organic? farm-fresh? Fertile Eggs or Infertile Eggs? I once had a co-worker politely decline my gift of a dozen eggs (from the fabulous Cobble Hill Farm Coop Girls) because she told me she only eats fertile eggs (and we no longer have a rooster). I was surprised. First, that she saw a difference between fertile and infertile, as it relates to eating them and second, that she had a place where she was purchasing fertile eggs. So I asked. Where do you buy your fertile eggs? Long story short, she mistakenly thought the grocery store eggs she was purchasing were fertile. There is now so much publicity on how chickens are raised I guess I become very surprised when others truly don't know. Chickens raised for commercial egg production are not hanging out on a farm, scratching around, hanging out with roosters and such. It just doesn't happen. Commercial egg farmers (or any farmers for that matter) don't make much of a profit margin, so they can't afford to pay for extra space or to feed roosters. And they certainly can't run around their property searching for eggs laid in bushes, behind outbuildings, in the woods, or wherever else they may be. So, although you may find fertile eggs at a farmer's market for sale, you are unlikely to encounter them at a traditional grocery store. I grew up not too far from a large chicken farm. And it was awful. The cages were stacked, I have no idea how high (VERY high), and each one gave them barely enough space to sit. That was their life. Sit and lay. There was no getting up, there was no outdoor time (until they were transported for culling), and there was nothing but commercial grains to eat - no bugs, no grass, and no oatmeal with blueberries (my girls would be SHOCKED!). As far as nutrition goes, there is no nutritional difference between a fertile egg and an infertile egg. The only benefit to having a fertile egg (for which you must have one rooster per 20 or so hens) is so you can hatch eggs if you desire. And no worries on accidentally hatching chicks from fertile eggs - refrigeration stops the growth process. 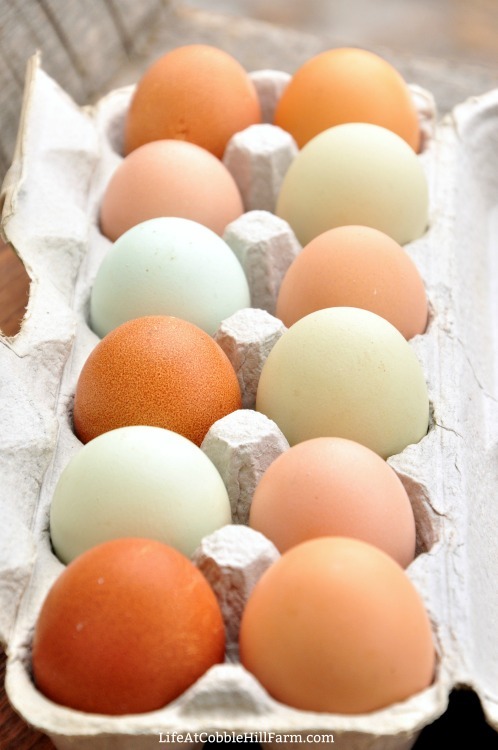 While we're on the topic, there is also no nutritional difference between a brown egg, a white egg, and/or a green or blue egg. It's simply from a different breed of chickens. That's it. But I can tell you from raising chickens for eggs, because we have all been led to believe that brown eggs are superior it is next to impossible to sell white eggs these days at the farmer's market. Why Are We Told Pastured Eggs Are Optimal? Pastured eggs ideally come from chickens who are allowed to roam on, well, a pasture. I say "ideally" because this is a term that's not currently regulated by the USDA. The idea is that they are free to forage and have room to run if they so desire. Although chickens can do ok on a diet of only grain, it's not natural for them. Chickens naturally eat greens, veggies, fruit, and bugs, and whatever else they come across outside. So pastured eggs (if truly pastured) are healthier for you and for the chickens (they have room to roam and are allowed to eat a natural, varied diet). Because this term is not currently regulated, you should be looking for pastured eggs only from a source you can trust. If you have a local farmer's market where you can speak with the farmer, or if they come from a large company who provides you the information you need to make your own decision. This brings up the subject of egg yolk coloring. The color of chickens egg yolks is a direct result of what they eat. This isn't to say you can judge a "good" egg from a "bad" egg based on the color of the yolk. Here's why - you can raise a chicken in a confined space on a diet of only grains and still get the birds to lay eggs with vibrant yolks. How? By putting dried marigolds, or annatto seeds, or other yellow-ish natural products in the feed. You can even have a pastured bird with a more pale yolk color, it just depends on what they primarily eat. So Which Eggs Should I Buy? It depends. I know that's a horrible answer, but it's the truth. It depends on what's important to you. 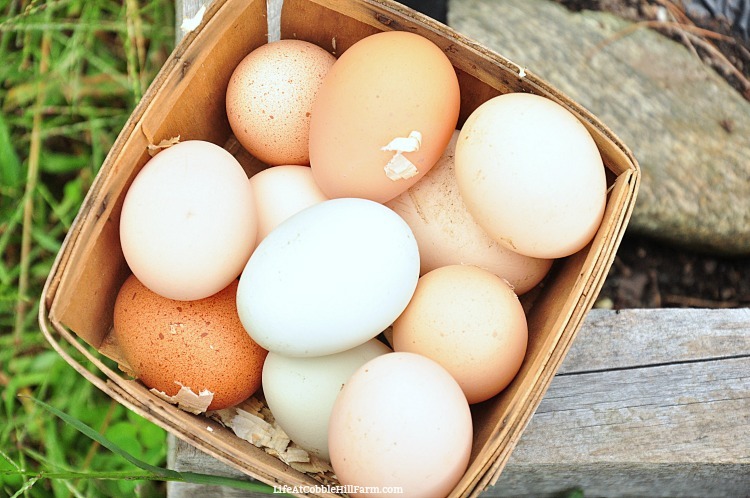 If you want what's best for the chickens, then you should purchase pastured eggs. These birds are allowed to live as close to their natural lifecycle as possible. It also comes down to how much you can budget for (I've seen pastured certified organic eggs for sale at $14.00 per dozen in a local store - yikes!) and what is the most important factor(s) to you. 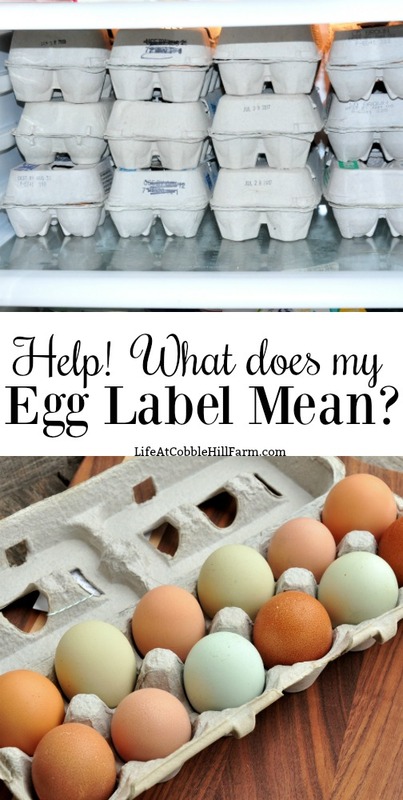 What Should I Ask A Local Farmer About Their Eggs? Remember that eggs cannot be advertised as "organic" unless the farm holds the certification. This means that it's important to not assume eggs found at your local farmer's market aren't actually organic. Because of this, you should ask. 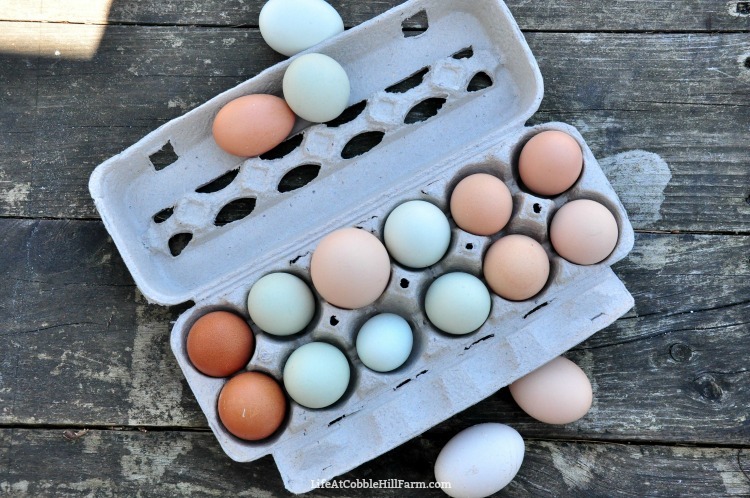 The farmer's markets that we participate in are full of eggs from pastured poultry and sell for $4.00 a dozen. And as far as the price goes, it's expensive to raise any animal and significantly more to raise chickens humanely (indoor AND outdoor space) let alone feeding a certified organic diet which costs more than double a regular diet. What Does My Egg Label Mean? And now, on to the labeling information and what it all means (based on information provided by the USDA). Certified Organic = hens are kept uncaged and are required to have outdoor access. They are fed an organic all vegetarian diet free of pesticides or antibiotics. Note: there are no requirements for space allowed. This could also mean that the outdoor access is very small and covered. Cage Free = hens are able to roam in indoor spaces and have access to fresh water and food. Hens must have access to enrichments such as a perch or nesting box. Note: there are no requirements for space allowed and this also only requires room to move indoors, no outdoor access is denoted. Free Range = hens are able to roam in indoor spaces, and have access to fresh water and food as well as the outdoors (which may be fenced or covered). Hens must also have access to enrichments such as a perch or nesting box. Note: there are no requirements for space allowed. This could also mean that the outdoor access is very small and covered. Vegetarian Fed = no animal byproducts are used in the feed or water. Note: this does not indicate any other requirements to the feed. It also does not give any requirements to living conditions. Natural = eggs must be minimally processed and contain no artificial ingredients. Note: this does not indicate any feeding or living conditions. The same theory that applies to meat also applies to eggs - you are voting with your dollars. If you choose to purchase the cheapest eggs possible, you are voting yes to animals raised in sub-standard (at best) conditions. If you seek out free range, pastured and/or organic, you are voting for giving the hens room to move as well as a little bit of outdoor space resulting in a better life. If you are able to purchase from a local farm where you know the hens are treated with respect, then you are voting for that. Ultimately, I know that cost is absolutely a factor. It is for us as well. We all have to decide how to best budget our money as well as what we're ok supporting and what we aren't. I am so grateful to have a friend who tends chickens. I get fresh, "clean" eggs for $2 a dozen, and feel comforted knowing that the girls are being well treated. Can't ask for better than that! Wonderful post...even though we have hens, when the laying slows and we need to purchase extra eggs, it can be quite confusing. While our girls get some oatmeal to keep them warm in the cold weather, what else do you feed your girls as treats? I read oats, berries, vegetable leftovers, along with mac & cheese. 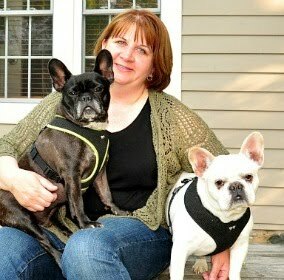 Can you share what's okay for them to enjoy and easy to eat...I never would have thought of mac & cheese! Daisy - that is indeed a wonderful thing!! Mary - thank you! We give our girls all leftover veg & carbs (grains, pasta, bread) with the exception of artichokes, raw potato/potato peels, & celery (too stringy & can get stuck in their crop). We also give them some leftover fruit except I don't give them much in the stone fruit family or tropical/citrus. We don't give them much in the way of sweets or garlic (could possibly make the eggs taste garlicy) and we don't give them meat. I keep a container in the fridge that we put all leftovers in and give it to them every other day. The things I make specially for them sometimes are oatmeal with blueberries, rice with milk or yogurt, and I sprout mung beans for them (they get very very excited about these). Budgeting is a BIG factor in what eggs I purchase. I don't like the term "...voting for..." but I understand it. I am retired and on a very limited budget so it is critical to me that I find the best price for eggs. During the spring/summer/fall, I purchase eggs at the local farmer's market but during the winter, I am not able to so I purchase the "best" eggs I can purchase at the local markets. That being said, the thing that I wonder the most about when purchasing eggs at the local grocery store is what the CODE is on the egg cartons. How do we know how old the eggs are?